Russia’s Central Bank has decided to adopt the latest global standards to tighten bank safety requirements on January 1, 2014. The requirements are expected to among the strictest in the Russian market. The Central Bank of Russia has prepared a pleasant New Year’s surprise for Russian banks: Basel III, the set of world standards that tightens capital requirements, will be introduced on January 1, 2014, instead of on October 1, 2013, as originally planned. As Central Bank Chairman Elvira Nabiullina announced, the regulating institution intends to synchronize its introduction of the Basel III requirements with the European Union and the United States. The Russian regulator’s gifts do not end here. 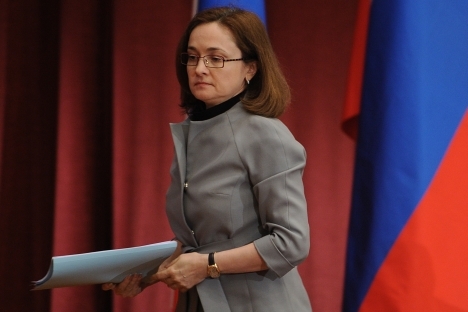 Under Nabiullina’s leadership, the Central Bank has decided to partially ease the requirements for Russian banks: Requirements for common equity will be set at the level of 5 percent, capital assets at 5.5 percent (with an increase to 6 percent beginning January 1, 2015), and aggregate capital at 10 percent. Still, these requirements will be stricter than the Western ones, which provide for the adequacy of common equity at the level of 4.5 percent. Thus, Russian bankers can breathe a sigh of relief: They have three extra months to bring capital in line with the new requirements. In the spring, several bankers had spoken out against Basel III’s arrival in Russia, being concerned that its rules would adversely affect creditization of the economy. In turn, the regulator promised to analyze Russian banks’ preparedness for Basel III and consider a possible postponement. Banks (even those not spooked by Basel III) welcomed the news from the Central Bank with restrained optimism. “Delaying Basel’s implementation for one quarter, by itself, does not, of course, fundamentally alter the situation. It only gives banks a little more time to strengthen sufficient capital ratio indicators through the issuance of subordinated instruments and the capitalization of current profit. The lowering of the minimum capital adequacy threshold from 7.5 percent to 5.5 percent is much more important. This gives banks considerably more room for managing capital structure,” said Mikhail Nikitin, a credit analyst at VTB Capital. In Nikitin’s opinion, transition to the new rules is not an insurmountable obstacle for most Russian banks. “In contrast to the banking systems in Europe and the U.S., asset structure in the banking sector remains comparatively basic, without the critical dependence of bank capital on hybrid instruments. And, on the other hand, the balance sheet structures are from the financial derivative market. Another aspect is that, in Russia, the Basel principles are to be implemented as a complete transition to the IFRS, without passing through the intermediary stage (Basel II), which implies more complex risk-management procedures in comparison with those used in Russian banks,” said the expert. However, according to many analysts, Russian banks are already fully prepared for innovation. In addition, some experts believe it would have been sensible to stick to the tougher regulations. In the opinion of Svetlana Pavlova, assistant vice president and analyst at Moody’s, shifting the dates of Basel III’s implementation in Russia and rejecting the stricter requirements for capital have a negative character to them. According to an analysis conducted by Moody’s, Russian financial institutions are ready for the implementation of the new rules. Even if the earlier, stricter plan had been implemented, only three banks out of the top 20 would have been incapable of fully complying. All the largest banks are currently in accordance with the new version of Basel III. Now, if one of the smaller banks cannot comply with the new regulations, they have more time to make adjustments. “By comparison, in mid-2012 Europe, not all banks were prepared for the implementation of Basel III — and it is no coincidence that, in the majority of countries, it is being introduced in several stages,” said Pavlova. “The banks were generally ready for the tighter requirements on capital assets [7.5 percent] that were originally planned. If this had been done, the Russian banking system would have become more stable,” the Moody’s analyst said. However, thanks to the economic slowdown and lobbying by the banks, the Central Bank decided to impose more lenient requirements on capital. “In general, capitalization is higher in our banks than in European ones. And this is correct: Considering the higher volatility of the Russian economy and tempo of growth of the banking sector, our banks need to be stronger to match the level of risk,” said Pavlova. On the question of whether creditization of the economy will undergo serious harm as a result of the new rules, the opinions of Basel III’s opponents and those of experts differ to a degree. “It is clear,” Pavlova said, “that no financial institution wants stricter regulation of the financial system. Nevertheless, the banks’ concerns over lending levels suffering as a result of Basel III’s implementation are slightly exaggerated.